"He met an incredible set of circumstances. The chances of somebody running into that combination of circumstances are slim, really slim." Tom Wernig’s life will be celebrated tonight, Jan. 7, at a memorial service at Sun Valley’s River Run Lodge. 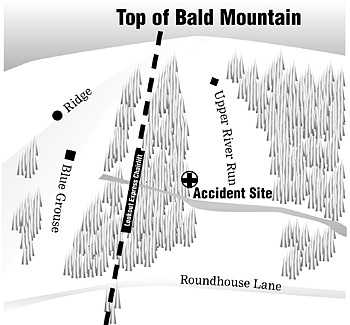 The event is scheduled to begin with a torchlight parade down Bald Mountain at 6 p.m.
Wernig, 40, moved to Ketchum in 1989. He is survived by his wife, Monica; daughter, Taylor; mother, Patricia; father, Fred; brother, Glenn; and sister, Lori Ann. In lieu of flowers, donations can be made to the Wernig Memorial Fund at the Ketchum or Hailey branches of Wells Fargo Bank. An obituary appears on Page A26 of the printed edition of the January 7, 2004 Idaho Mountain Express. A Sun Valley ski instructor found on Bald Mountain on Sunday, Jan. 4, following a three-day search is believed to have died from exposure to the elements and hypothermia. Blaine County Coroner Russel Mikel, however, said he believes that Hailey resident Tomas M. Wernig was unconscious as he succumbed to the cold. Mikel said he examined the body of the 40-year-old man Tuesday afternoon. He also said he did not plan to perform an autopsy. Wernig, described as an expert skier, loving husband and caring father, was discovered at approximately noon Sunday by an avalanche search dog near the skier’s right side of Baldy’s Upper River Run ski slope. He had been missing since New Year’s Day when a powerful storm pummeled Central Idaho, dropping snow at a rate of 2 to 4 inches per hour. During part of the storm, winds screamed at nearly 80 mph on the mountain. According to Sun Valley Ski Patrol Director Mike Lloyd, the storm was intense and forced mountain personnel to close the ski area’s upper and lower bowls and Seattle Ridge area Thursday afternoon. "There was such poor visibility and high winds," Lloyd said. Wernig, a native New Yorker who worked for Sun Valley as a children’s ski instructor for six years, had taught a ski lesson most of the day during the storm. After the conclusion of the lesson, he boarded the Lower River Run ski lift. His season pass was scanned at 2:45 p.m., and that was the last record anyone had of his location, said Sun Valley Co. spokesman Jack Sibbach. Lloyd said he was informed at 10:30 p.m. on Thursday that Wernig was missing, but deep snow and the associated avalanche danger from the day’s storm prevented the search from commencing until the following morning. Shortly after 8 a.m. Friday morning, the Sun Valley Ski Patrol began combing the mountain, Lloyd said. By noon, Blaine County Search and Rescue and Galena Backcountry Ski Patrol volunteers joined the search but did not turn up any clues. More than 150 volunteers explored the mountain each day. 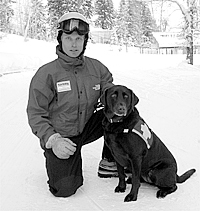 But it was ultimately a trained avalanche dog owned by Sun Valley Ski Patroller Troy Quesnel that picked up Wernig’s scent just off the beaten path to the skier’s right side of Upper River Run, about 50 feet above a seldom-used cat track called Duck Lane. The 3-year-old dog, Kintla, led rescuers to a cluster of partially buried trees. Wernig was found, upside down and tangled in the young pine trees where the snow had given way into a phenomenon called a tree well, where pine boughs suspended the snow above a pocket of air. The snow there was approximately 6 feet deep, Lloyd said. It is unclear exactly how Wernig became trapped, said Blaine County Sheriff Walt Femling, who helped remove the body. It is clear that he met an unlucky and unfortunate predicament. "He met an incredible set of circumstances. The chances of somebody running into that combination of circumstances are slim, really slim," said searcher Taul Paul, a member of the Galena Backcountry Ski Patrol and Blaine County Search and Rescue. "I can see that somebody who had several things going against him, he had very little opportunity to move to extricate himself. That’s a pretty incredible set of circumstances." 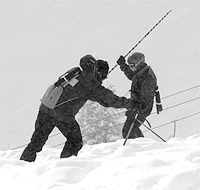 At the conclusion of each ski day, members of the ski patrol perform a "sweep" of the ski area to look for trailing or injured skiers before closing the mountain. Lloyd said patrollers search ski runs in zigzag patterns while calling out for anyone still on the mountain. Every run was swept before the mountain was closed Thursday, Lloyd said. 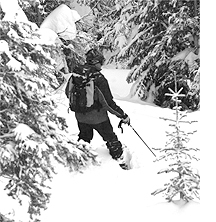 Trees and off-trail areas, however, are not typically searched during a sweep. According to Lloyd, Wernig’s chances would have been better if he had been skiing with a partner. "For anybody under those conditions to be skiing alone—when it’s snowing or you’re skiing in the trees, you don’t ski alone," Lloyd said. At the beginning and end of each search day, searchers gathered at the River Run day lodge. Sunday morning, the day Wernig was found, his wife, Monica, gave an impassioned plea for searchers to find her husband that day. An air of determination emerged from the packed room of searchers, who were visibly moved by the request. 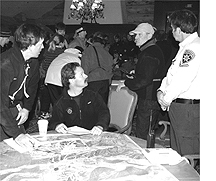 Later that day, during a de-briefing, Sun Valley Ski Patroller and search coordinator Tim East thanked the numerous volunteers. "As I look out into this room and see all you volunteers, my heart is in my throat," he said. Femling said the search was thoughtful and very well coordinated, but pointed out that doing everything right doesn’t always garner the desired results. Paul observed that the search was big, "a needle in a haystack kind of thing." "We realized that, first of all, you want to find the person before they succumb to the elements," he said. "Secondly, you want to find the person for closure for the family and the loved ones. "In this case, as big of a job as it was, we were able to accomplish the second half of the task. We weren’t able to accomplish the first objective, but we were able to bring closure." 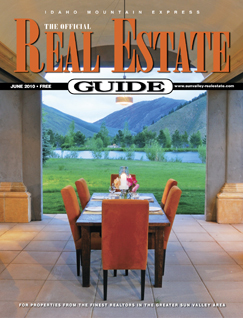 Mountain Express photographer Willy Cook contributed to this article.